The critical zone of the rotator cuff is an area of relative avascularity near the humeral insertion of the tendon. Repetitive compression and impingement cause ischemia in this area. With time this area degenerates and ultimately tears. The critical zone is the most common site of all rotator cuff tears. The supraspinatus, due to its location within the coracoacromial arch, is the most commonly injured rotator cuff muscle (Fig 2.7,5.-5.). FIG. 275-5. Rotator cuff tear. 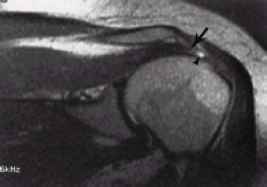 MRI coronal image of shoulder reveals tear in supraspinatus tendon at the critical zone (arrow) with edema (point). The bony structures of the shoulder can also contribute to rotator cuff tears. The acromion, which forms part of the roof of the coracoacromial arch, may be described as flat, curved, or hooked (Fig 2.7.5.-6). One clinical study associated a hooked acromion with 80 percent of rotator cuff tears, whereas a flat acromion was associated with fewer than 3 percent of tears. Acute traumatic rotator cuff tears, which account for 10 percent of all rotator cuff tears, require a significant force. For a single traumatic event to cause a rotator cuff tear, the force must overcome the tensile strength of the tendon. However, the tensile strength of the tendon is greater than that of bone; therefore, a bony avulsion injury of the humerus is much more common than an isolated rotator cuff tear following acute trauma (Fig 2.7.5-7,). FIG. 275-7. Tensile strength of rotator cuff tendon is greater than bone. The patient suffered acute hyperabduction injury to arm causing extreme shoulder pain and dysfunction. 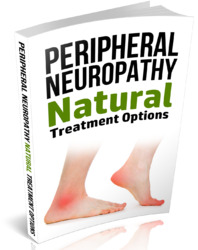 Initially, radiographs ( A) were interpreted as normal. 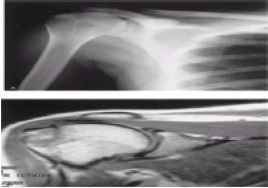 MRI (B) of shoulder revealed avulsion fracture of humerus at site of supraspinatus tendon insertion.